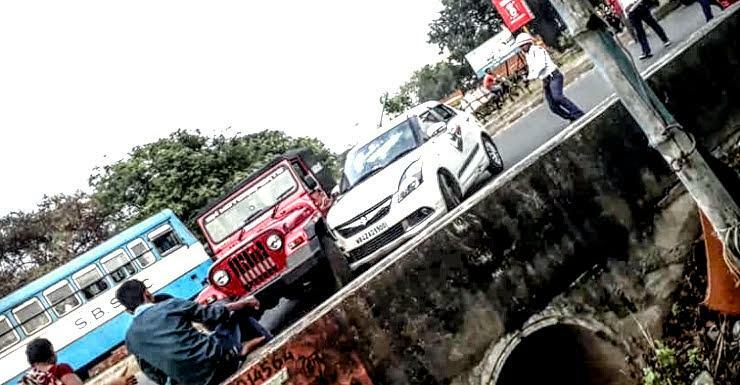 In what seems like a car chase straight out of video game, a Mahindra Thar owner from West Bengal, Sumantra Aich, gave a bunch of alleged drug peddlers a big chase. Cops in Burdwan, West Bengal, tried to stop the alleged drug peddlers, who drove off, nearly ramming into a group of police personnel while making a getaway. The Thar driver then chased the car in which the alleged peddlers were travelling, and nearly became a hero in the process. Here’s a first person account of what actually happened, along with a video. While Mr. Aich couldn’t stop the Maruti Dzire compact sedan that had the alleged drug peddlers in it, he sure gave them a scare of their lives. In the video, Mr. Aich is repeatedly seen ramming into the Dzire from behind. He also tries to run the car off the road but doesn’t succeed. Full marks for effort though. The high voltage car chase also sees both cars speed across busy roads with chaotic traffic. While the chase didn’t see any civilians getting injured, it could have easily gone wrong had one of the two cars lost control. Car chases by civilians – Yes or no? This is a question that the cops in Burdwan have to answer. Clearly, chasing down a criminal on public roads by an unarmed civilian is downright dangerous. There’s no information on whether Mr. Aich was acting on his own accord, or whether the police personnel – who were also trying to nab the alleged peddlers – actively supported Mr. Aich’s chase. Ideally, cops ought to be doing the job that Mr. Aich tried to do. It’s dangerous to involve civilians in car chases. While this situation could have been extraordinary to merit intervention by a civilian, it’s best that law enforcement deals with such situations.